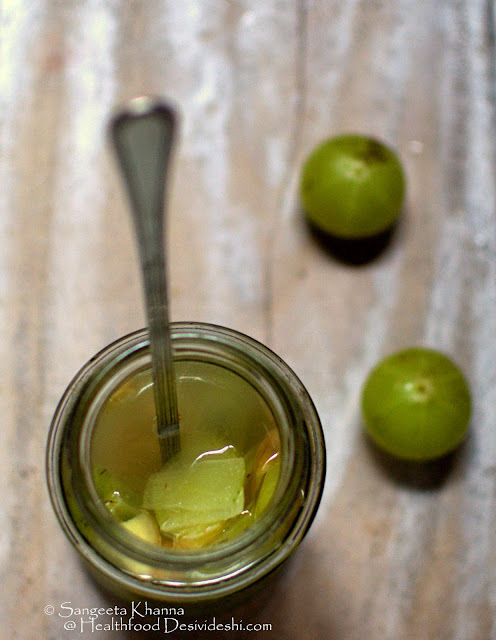 I have been using the Indian Gooseberry aka Amla or Aonla as it is called in Hindi, a lot these days. Amla starts appearing in the markets in the autumn season and keeps coming till the winter lasts. As if to provide immunity towards winter ailments in the country where winter can be really harsh and there are no central heating in homes. Winters are short but come with a few ailments thanks to lowered immunity during this time. Amla helps boost immunity but there are many people who don't like the taste of amla and completely ignore this seasonal bounty of nature. While we love the boiled amla chutney and instant amla pickle (amle ka achar) along with random green chutneys made with coriander and mint greens and a few amla berries thrown in, there are people who detest the slightly astringent taste of amla. This amla coconut chutney is one where nobody has detected presence of amla as yet, the chutney is served with idli and dosa. Some readers on my facebook page (Healthy Living With Sangeeta Khanna) asked me how to make brined amla so everyone in the family can eat it regularly and I was reminded of the brined amla I had tasted at a Maharashtrian friend of mine. Those were small amlas, brined whole in heavily salted brine that they serve to start with the meal as a palate cleanser and digestive. Later I tried with segmented raw amla and sliced raw amla and both ways it was a great pickle to have on hand. I still have a kilo of brined whole amla in my pantry and use those slightly darkened berries to make green chutney sometimes. 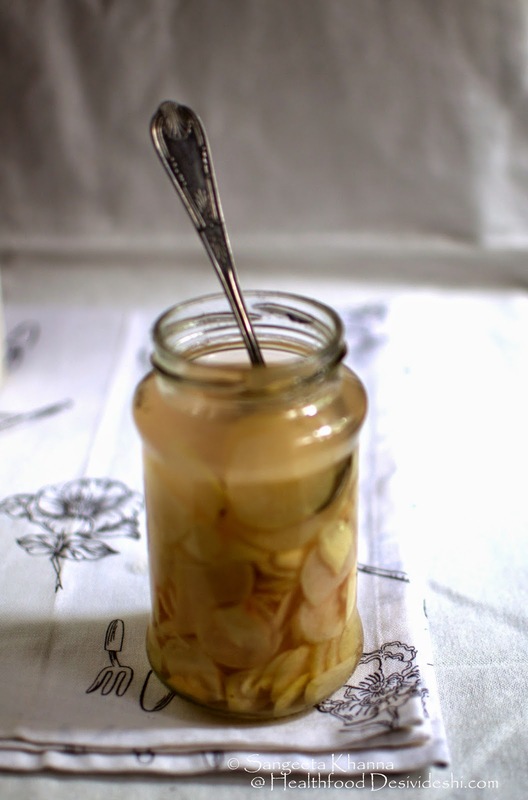 But the sliced amla works really well for salads and sandwiches or served as it is on the side just like you serve pickled jalapenos, vinegared onions or pickled gherkins etc. Sliced amla makes the brine pickle more versatile in use as you can throw a few slices in any chicken, boiled egg, tuna or sausage salad along with other greens. 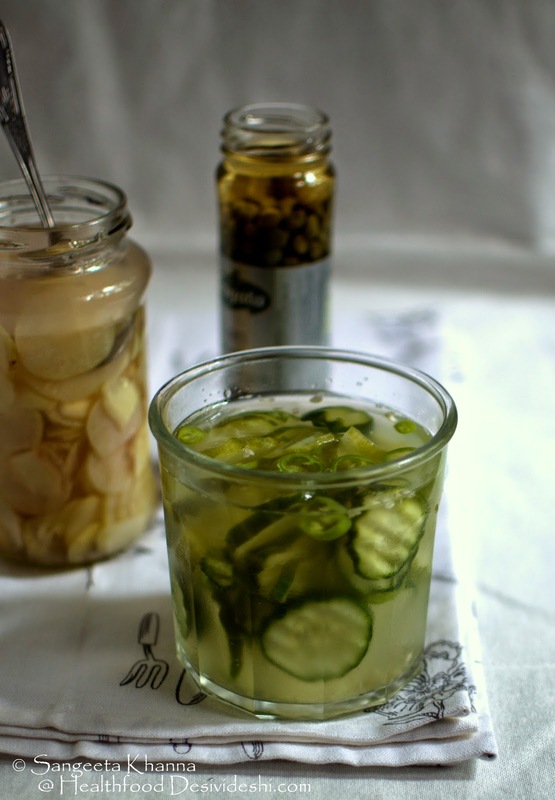 You can actually make brined pickles of any vegetables you wish. Cucumbers, cabbage, ginger and garlic behave really well along with grapes, radish, turnips, carrots, beets, knol khol etc. try with any of these vegetables and add slice jalapenos, bell peppers or any other sharp spices if you wish. How to prepare the brine? Brine is just a solution of 30-35 gm of table salt and a Liter of filtered water. No heating required. Just mix both till the salt dissolves. Now you can use any vegetables sliced in bite sized pieces and pour the brine over them. Just make sure you pour enough brine to cover the vegetable slices to make sure the fermentation in anaerobic and no contamination happens to the floating slices of vegetables. The vegetable slices start getting sour by the next day, it means the fermentation has started. Watch out for the desired sourness and once you get your kind of sourness and softness of the vegetables, just refrigerate the brined pickle and use it for a month** or so. ** the longevity of the brined salad will depend on the vegetables used. Cucumbers get really soft and loose texture after souring for 3-4 days on room temperature but stays well if refrigerated after a day of souring. But will stay good only for a month or so. Amal will get perfectly soured and free of astringent taste within 3 days and will keep well on room temperature for a year or more. So it all depends on how well the vegetable slices behave with souring and softening the tissue. Amla slices remain firm and crisp all the while. This is how amla looks when freshly brined along with a few slices of ginger..
Ginger gives a nice pink colour to the brined pickle. See how it looks after 4 days of fermentation. This colour stay for about 6 months and later it started darkening a bit but the taste and benefits remain the same. 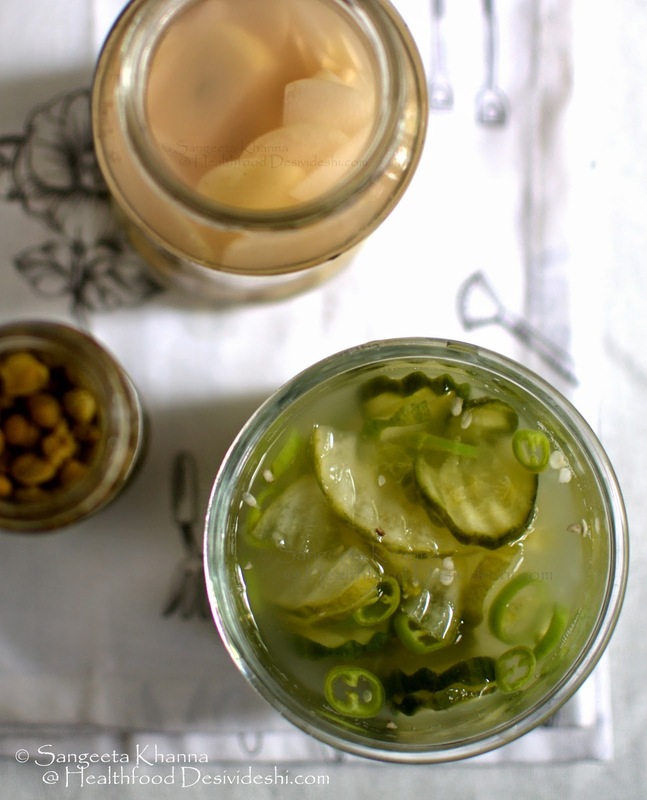 Few points to keep in mind when brining the vegetables..
Use sterilised glass jars or ceramic jars for brine pickling. Use as much vegetables as you wish but do not fill the jar to the brim. Keep some space for the brine. Wash and clean all vegetables being used really well. Clean the knives and chopping board properly before chopping the vegetables on them. Pour the brine solution just after chopping the vegetables. Do not keep the cut vegetables open for long. Most vegetables keep submerged if you pour enough brine over them but some vegetables like cabbage or mature radish etc may float to the surface and keep exposed to the air, put a small sterilised bowl or plate above the brined pickle to keep all vegetables submerged. This is to provide anaerobic fermentation condition to the pickle. Open the lid once a day to check contamination and taste the pickle about sourness and desired softness of the vegetable being pickled. Refrigerate once the pickle is fermented enough for your liking. Note that brined Amla doesn't need any refrigeration. You can even brine raw mango slices, Amda (Hog plums), sour plums and even small sour apples this way. All these can be used to make salads, chutneys, pesto and as a souring agent for curries and stews as desired. Add seasoning and spices as desired. For the above cucumber brined pickle I just sliced cucumbers and jalapeno peppers (bhavnagri mirchi) and poured brine over it. There is a kick of chilly heat in this pickle that everyone likes. The tall bottle in the background is store bought pickled capers. We don't get capers here but you can make your own pickled capers too following the same recipe and method discussed here or just like this blogger does. Some people make brined amla with boiled amla but that is not the best way to bring out the flavours and that is not a probiotic pickle as well. 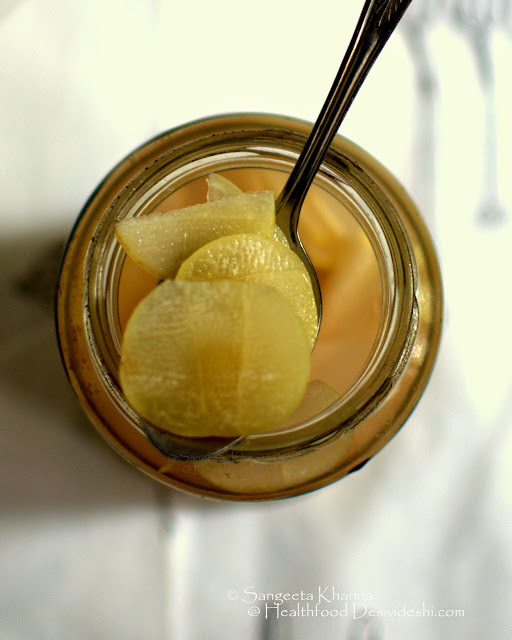 I recommend this brined pickled amla for multiple health benefits. See this apple and red cabbage pickled salad I make with home made vinegar of different types. The probiotic benefit from all these pickles is similar but the taste and longevity of the pickles will be different depending on the vegetables/fruits and pickling solution used. This is the season for amla to be brined so go ahead buy some amla and slice them fine. I even added the remaining stone of the amla along with some remaining flesh after slicing to the brine and the pickle is being picked up on the dining table quite frequently. Sangeeta this reminds me of my Kerala trip. Amla in Brine is a big hit. Push carts in sea shores as well as hill stations sell them. My friend had it in her kitchen. Every home I visited had one or more amla trees. I sheepishly admit your's truly has done the same. Love pickles of all kind! This looks like the simplest ever. I Just stumbled upon your blog by chance and have been reading all your post then. I have a question and would really help if you answer it. I made amle ka achar following the recipe in your other blog, banaras ka khana. However after storing it in the jar after 3 days I noticed white fungus in it. I am not sure what went wrong, I had to throw all of them. I had even showed them sunlight next day after making it. If you think you would know what could have gone wrong please do let me know. Thanks Butterfly. The amle ka achar recipe on Banaras ka Khana blog is meant to be refrigerated since it uses less salt. I have mentioned in the recipe that it should be refrigerated and lasts for a month if stored that way. It wont last more than 2 days at room temperature. Sorry for the loss of your pickle. 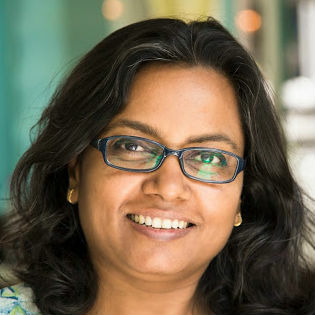 Thanks Sangeeta. Yes I didn't refrigerate it and that was the mistake. that's ok, I will try and do it this way this time. thanks for the clarification. and all your recipes are very good and the best part we can make them at home without any fuss. love your blog.if you can put up some simple cake recipe which is kid friendly will be great as I am new to baking and would love to read your recipes. There are a few basic cake recipes on this blog. Please search the labels you would find something you like. Do we need to add sugar and yeast to enhance fermentation process?